This is a well-played disc of pleasant Classical era music written by composers who relocated to Amsterdam to practice their art: Wilms and Schmitt from Germany, Fodor from Austria. I had rather high expectations of the Wilms Concerto based on a disc I reviewed of two of his symphonies recorded on the Archiv label. These symphonies were chock-full of compelling melodies and reflected serious matters. To my regret, Wilms' Concerto has less substance and emotional depth. A likely prime reason for the differences is that the Concerto was composed in 1798, while the symphonies were penned in the 1820's-30's. The 1st Movement Allegro of the Wilms is a lengthy one at over 12 minutes. It has plenty of drive and fetching melodic content until the development section begins about 6 minutes into the movement. I have to say that Wilms isn't very good at expanding on the themes presented in his expositions; I noted this same problem on the Archiv disc. However, the 2nd Movement Poco adagio goes well with a sad and tense first section followed by an heroic second section featuring the brass. The 3rd Movement Rondo allegro offers a perky theme that I surprisingly find myself humming occasionally. The Schmitt Quartet is also a fine work with more of a baroque flavor than the Wilms Concerto. The Quartet's 1st and 3rd Movements present a carefree and playful personality except for infrequent minor key passages, and the woeful music of the 2nd Movement is beautifully played by the highly esteemed flautist Wilbert Hazelzet. The G minor Concerto by Fodor is a highly enjoyable work of more serious intent than the Wilms or Schmitt. To a degree, the Fodor reminds me of Hummel in terms of variety of expression and overall musical fecundity. The 1st Movement contains many compelling motifs and a fine degree of tension, the 2nd Movement Adagio is an elegant charmer, and the 3rd Movement takes us on a journey to the European notion of Turkish music replete with a "Turkish Fanfare" that is most captivating although hardly accurate. The period instruments are a pleasure to listen to and quite a departure from recent trends in period instrument sound worlds. Remember the early years of period instrument recordings? The sound world was tangy, a little wiry, crisp as hell, and piercing. Those who disliked this sound world reported on the ugliness of it all. In recent years, the period instrument sound world has moved closer to modern instruments with a suave and rich sound of greater instrumental blending. Schoonderwoerd and Cristofori take us back to that initial sound world; although it can be a little hard on the ears, I just love those piercing strings and hard definition among musical lines. 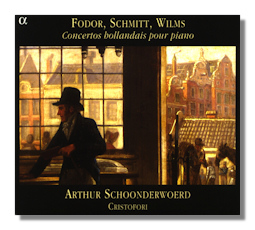 Concerning the keyboard instruments, Schoonderwoerd plays the Wilms and Schmitt works on a tangent piano, then switches to a fortepiano for the Fodor. The main differences are that the tangent piano has the more aggressive tone, while the fortepiano sparkles and blends more into the orchestral fabric. Although both Schoonderwoerd and Cristofori could have injected greater imagination into their interpretations, I am well satisfied with the performances. Don's Conclusions: Fine music, but it is not great music by any stretch. I'll go with a mild recommendation for general audiences and a strong one for those who love period instruments for the same reasons that traditionalists hate them.